This mans shawl collar cable knit sweater is knit using traditional knitting patterns from Ireland. 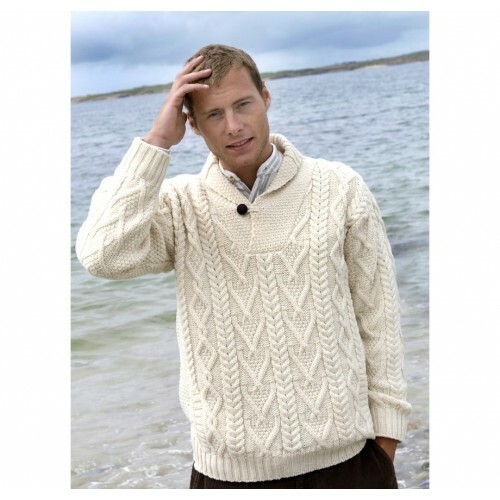 The "V" neck shawl collar is the main feature of this Irish sweater. It is completed with the use of an old style button closure. The diamond knitting pattern along the body is said to represent wealth and success. The traditional cable pattern symbolising fisherman's ropes unite the past with the modern day. The use of the herringbone stitch along the body and the length of the arms is further linking this garment with times gone by. This garment is available up to size XXL. True Irish style for the modern man.